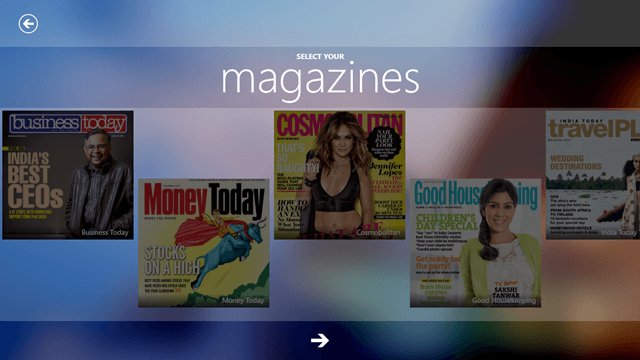 Plash is a free Windows 8 magazine app that allows you to subscribe to the magazines that you like for absolutely free. When you launch the app, you will be first asked to create a free Plash account. 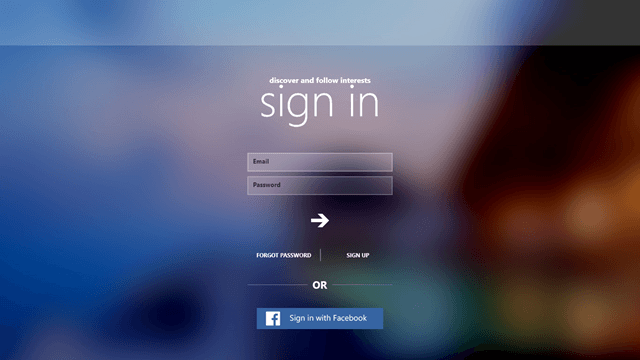 You can either sign up with you email id, or you can choose to sign in using your Facebook account. Once that’s done, you’ll be asked to select your interests, and after you have done that, you have to select the magazines that you wish to subscribe to. The app has a large collection of different magazines like Cosmopolitan, Men’s Health, etc. Plash runs incredibly smoothly on all Windows 8 devices, and the best part about this app is that it is incredibly polished. 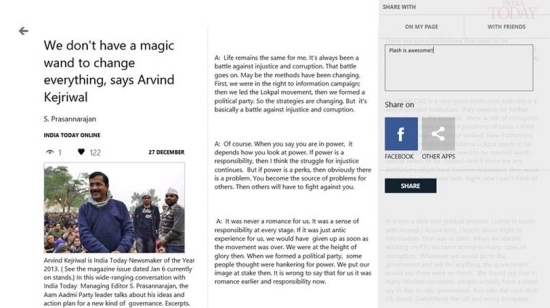 Clicking on a post will open up the reader interface of Plash from where you can read the articles easily. Now let’s read on more about this app is detail. When you launch Plash, you will be presented with a screen which looks like the following screenshot. As I personally didn’t have a Plash account before this, I chose to sign in via my Facebook account, and soon enough, I was shown a login screen where I was asked to input my Facebook credentials. Upon doing that, I was taken to the next screen which looked like the below screener. As you can see above, this one was a scrollable list of Interests. I was asked to select the content that I was interested in. The content that I clicked on got ticked, and once I was done selecting the content that I wanted information about, I clicked the arrow button at the bottom of the screen. Now, I was asked to choose the magazines from which I wanted the content to be fetched. After I was done selecting my choice of magazines, I clicked on the arrow button at the bottom of the screen again, and this time, it took a while for the next screen to load. In this screen, I was shown all the fetched content (in form of various articles) from various magazines! Here, on the left side of the screen, I could click on the magazine from which I wanted to view the content. I could also click on SWITCH TO INTERESTS at the bottom of the screen to switch to the contents for whatever interests that I had selected while setting up the app. You should know that this panel at the left can be hidden by pressing the triple lined button at the top left corner of the screen. It can again be revealed by pressing the same button! 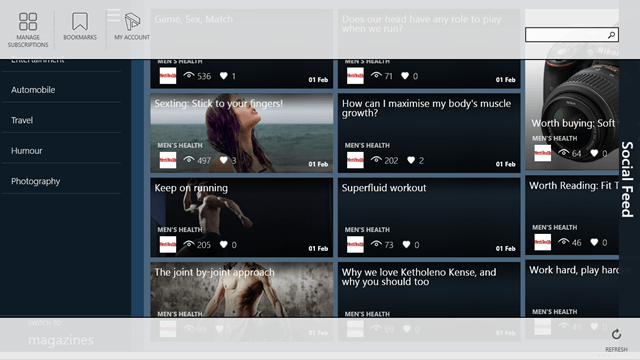 When you click on a particular article tile, it will automatically be rendered in a beautiful full screen interface. See the below screenshot to know what I mean. Finally, the control bars of the app can be accessed by right clicking anywhere within the app. Using the control bar at the top, you can manage your subscriptions (add or remove more magazines or interests), access your Bookmarks, view information about your account, or choose to search for content using the search bar. The control bar at the bottom has the only feature- that is to refresh the feed displayed inside the app. I really don’t understand the reason for twin control bars, when the developers could have easily squeezed the controls into one control bar – perhaps they did it to felicitate symmetry?! Who knows! 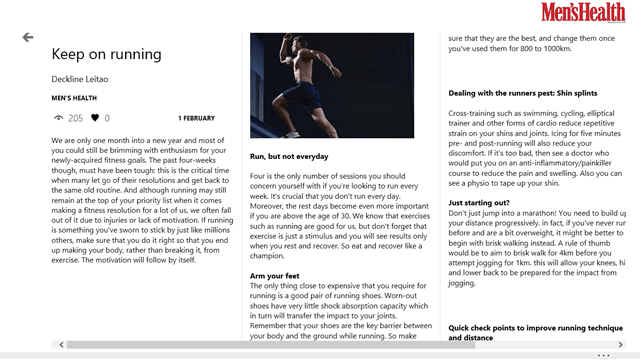 Do check out some free Windows 8 RSS Reader and some News Reader apps. 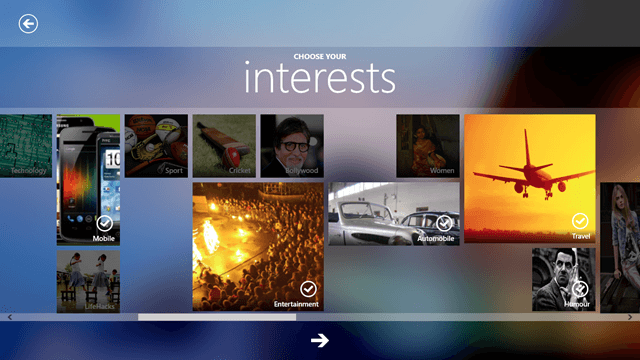 Plash is a good app to have on your Windows 8 device that allows you to access and view feeds related to your interests. The best part about this app is that it fetch these feeds from popular magazines that everyone might already have heard about, and thus you can rest assured that the quality of the articles and items in this app will be at par!